Concrete removal and replacement is often the best option for concrete that has settled or sunken due to an improperly prepared subgrade, or for concrete that has settled due to some sort of heavy equipment or heavy load that was placed on the concrete. 1. How Does Concrete Removal Work? Demolition contractors use various tools and equipment for concrete removal and concrete demolition. For large concrete slab removal contractors frequently will use a bobcat with a hydraulic concrete breaker attachment to break up the slabs. For smaller jobs, or tighter areas, demolition services may use a person with a pneumatic jackhammer to break up the concrete. The concrete is then loaded into a dumpster and then hauled away. 2. How Much Does Concrete Removal Cost? Concrete removal varies in cost depending on several factors. The price of concrete demolition depends mostly on the size of the job. A small patio or walkway will cost less to demolish than removing concrete from a driveway. When it comes to driveway concrete removal the size and condition of the driveway greatly affects the price of concrete demolition. 3. Can I Do My Own Concrete Removal? Depending on your level of expertise you may be able to do your own concrete demolition. 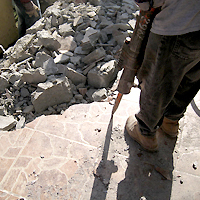 However we recommend using a demolition contractor skilled in concrete removal in most cases. Do-it-Yourself concrete removal can often damage your home permanently. Improper concrete demolition can cause permanent damage the foundation of your home. Improper concrete demolition can also add additional repair costs to your project. In almost all cases hiring a skilled demolition contractor who is experienced at concrete removal should be your first choice. 4. Do I Need a Permit for Concrete Demolition? Whether you need a city permit for concrete removal depends largely on your city and state. Some municipalities will require a permit for any type of demolition work, other cities may simply require notice, or no permit at all. Before beginning the process of concrete removal make sure you check with both your city’s building code enforcement office and your demolition contractor to ensure you are fulfilling the necessary permit requirements. 5. Can Concrete Removed from My House be Recycled? In most cases, yes, concrete removed from your home can be recycled. Demolished concrete can be sent to a concrete recycler who crushes it into aggregate and reuses it in cement. 6. How Do I Choose a Concrete Removal Contractor? Make sure your contract removal contractor is licensed, bonded and insured. Make sure they are experts in the field of concrete demolition and removal. Deconstruction Pro. has years of experience with concrete removal and concrete demolition.